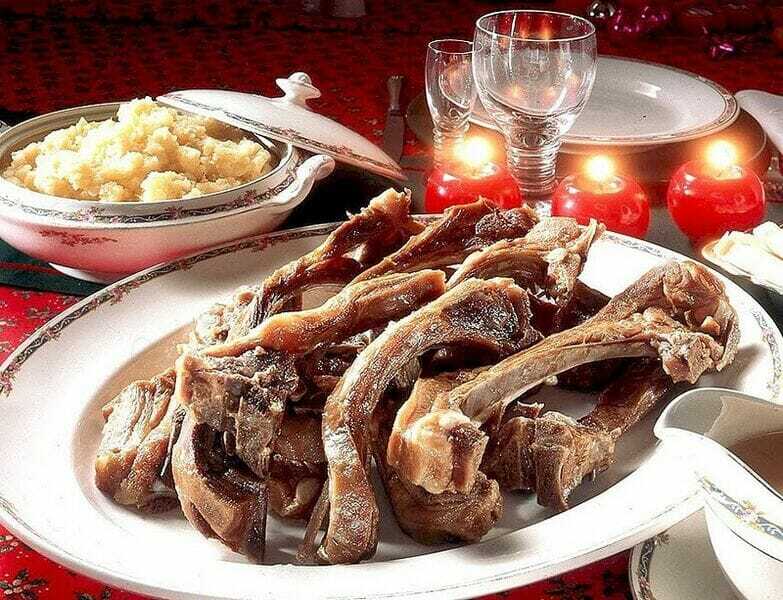 Pinnekjøtt is one of many Christmas dinners eaten in Norway. Traditionally eaten on the west coast of the country, but it is gaining popularity elsewhere too. In many places in the west of Norway, you'll know it is Christmas when the church bells chime in the afternoon of the 24th and the air has a faint smell of pinnekjøtt cooking. As the sun sets and people move inside and out of the cold, julefreden senker seg. Christmas peace descends across the country. 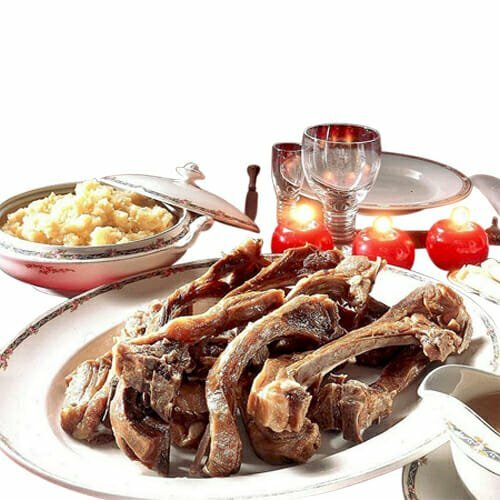 Pinnekjøtt is ribs from lamb that have been salted, and sometimes also smoked, to preserve it. For preparation, the meat needs to be soaked in water to remove most of the salt. The result is an intensely delicious and savoury piece of lamb - quite unlike anything else, and very very good (why yes, the writer of this recipe is Norwegian - but strictly objective, of course). Side dishes vary between families, but a type of swede mash is always present. The natural sweetness of swedes works really well with the meat – finish off your plate with a dollop of lingonberry jam and have a shot of aquavit to drink. Some people also serve plain boilt potatoes and green beans, although this is not part of the traditional meal. Place the meat in casseroles or big bowls (or a pyrex dish – anything will do) and cover with plenty of water. Leave in room temperature for approx. 30 hours. Why do we do this? Pinnekjøtt is meat that has been salted and dried, soaking it ensures it regains its consistency – as well as making it palatable by removing most of the salt. How long this takes depends on the thickness of the meat, as well as the temperature of the water. Tepid water will speed up the process. Pour off the water and place the meat to one side. In your biggest casserole(s), place a metal rack or birch branches in the bottom. Add water until it covers the rack or your branches. Place your meat on top and cover with a lid. Leave to gently steam cook at low heat for approximately 3 hours. Sausage can be added to the casserole for cooking for the last 15-20 minutes; chop into chunks of 2-3 inches to ensure they cook through. It is done when the meat falls easily off the bone. Peel your vegetables and chop coarsely into even-sized pieces. Boil until tender in lightly salted water. Leave for 3 minutes to dry, then mash by hand. Add cream and butter and give it a good stir. Add salt and pepper to taste. Add a pinch (not too much – this has a very strong flavour) of ground nutmeg if liked – the slight sweetness goes really well with the salty meat. If you think the mash is too thick, loosen it with some of the pinnekjøtt cooking water. Serve with pinnekjøtt, lingonberry jam, perhaps some freshly boiled potatoes and a good shot of aquavit.